TFSAs – how to maximise the tax benefit? In recent times, a great deal of column inches have been dedicated to post-retirement solutions and particularly the suitability of living annuities. This is unsurprising, considering we have found ourselves in an environment where returns across asset classes have been hard to come by and investments in living annuities have struggled to keep pace with the level of income being drawn from them. The Association for Savings and Investment South Africa (ASISA) announced that the average living annuity drawdown rate increased from 6.44% to 6.62% in 2016. This is incredibly important because it has a significant impact on the sustainability and longevity of retirement capital for retirees. An individual retiring at age 65, who starts drawing at 6.62% and increases their drawdown each year in order to keep pace with inflation, will reach the legislated maximum income withdrawal (17.5% of the capital value) within 15 years of retirement. This is a frightening thought, given that many individuals could be expected to live for ten years or more beyond this age. Put simply, legislation and the ravaging effect of inflation will not allow them to continue drawing enough in monetary terms to meet their monthly expenses from this point onward. 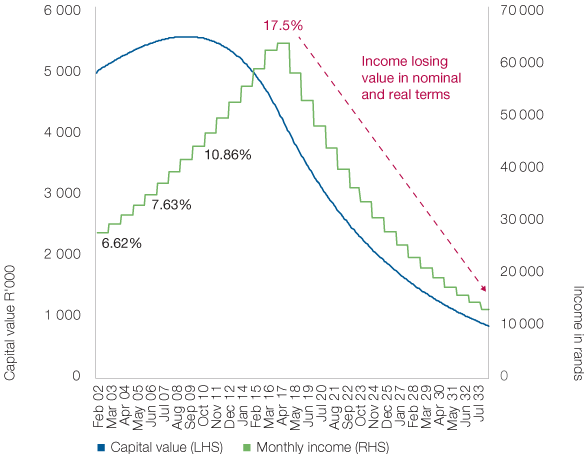 Figure 1 shows the relationship between the starting level of income, capital value and the amount of income drawn in rands and cents. It is painfully clear from Figure 1 that 6.62% is not an appropriate level of income for an individual to draw from day one of retirement. As a point of reference, the average Investec Investment Management Services (IMS) living annuity client draws just 5.5% from their living annuity – more than 1% less than the industry standard. The majority of these clients start drawing their income at a level of 5% or below. If we repeat the exercise starting at 5%, the arrival at this crisis point is delayed by an additional ten years, meaning that a client retiring at age 65 would reach the age of 90 before they cap out at 17.5%. This would dramatically reduce the number of years over which they would need to reduce their standard of living as well as the likelihood that they become a financial burden on their family, as can be seen in Table 1. Source: Investec Asset Management. For illustrative purposes only. Starting value of R5m. Income drawn at 6.62% income taken monthly escalating by 6% p.a. Assumed return of CPI + 3%. CPI assumed to be 6%. Source: Investec Asset Management. Assumed returns of CPI plus 3%. Inflation assumed to be 6%. Starting value of R5m used for 6.62% initial income example and adjusted in each scenario to ensure starting income matched across all scenarios in monetary terms. Income taken monthly and escalated at 6% p.a. to keep pace with inflation. As an advisor-driven investment platform, the vast majority of clients in our living annuity product are fortunate enough to have access to independent financial advice. It is no surprise that those who receive guidance on such important matters are aware of the consequences of drawing too high an income and, thus, avoid doing so at all costs. b) That those contributions are employed in high quality investments strategies. The combination of these factors helps to ensure that an individual reaches retirement age with sufficient assets to ensure they can meet their monthly expenses by drawing an income which (in monetary terms) equates to less than 5% of their capital value at the outset. To achieve this, an investor needs to be invested in a portfolio that can deliver inflation-beating returns in both the saving and spending phases. With historical returns in the region of 6% p.a. above inflation, the ASISA Multi Asset High Equity sector has been the hunting ground for funds capable of delivering these sorts of outcomes for investors. However, within the sector, there is a huge dispersion between the best and worst performing funds (more than 9% p.a. difference over the ten years ending August 2017). Fund selection plays a huge part in delivering successful outcomes and this is a critical area where an advisor’s knowledge and experience adds tremendous value for investors. The Investec Opportunity Fund has been utilised by many financial advisors in structuring investment plans that have helped their clients to achieve their goals in retirement. The Fund's focus on absolute returns ensures that it strikes the right balance between wealth creation and risk of capital loss, thus making it suitable for both the saving and post-retirement phases when investors begin to draw money. The Investec Opportunity Fund has delivered consistent inflation-beating returns over the long term, which have allowed living annuity clients to ensure their income keeps pace with inflation while also allowing their capital to grow. Figure 2 shows a R1 million living annuity investment into the Investec Opportunity Fund ten years ago and the impact of income taken on value during that time. This demonstrates how choosing an investment fund with a strong focus on generating inflation-beating returns can help to avoid the scenario where the value of the income drawn reaches the maximum percentage allowed by legislation. Here we have started with an income value of 5% and increased the amount annually to account for inflation. The returns from the portfolio have ensured that ten years later, the income drawn is still only 6.2%% of the capital value. This compares favourably with both the ASISA Multi Asset High Equity and Multi Asset Low Equity sector averages. Most importantly, during the financial crisis from 2007 to 2009, the income taken from the portfolio peaked at just 6.56% of the capital value. Source: Morningstar and Investec Asset Management, as at 31.08.17. For illustrative purposes only, based on income of 5% taken monthly escalating at 6% p.a. Performance figures are based on a lump sum investment, NAV to NAV, net of fees. Highest and lowest annualised returns since inception of the fund (12-month rolling performance figures) are 43.8% and -15.7% respectively. The total expense ratio of the fund (A class) is 1.84%. The comparison with the Multi Asset Low Equity sector in Figure 2 is particularly interesting as the sector has a greater bias towards assets that produce income. This demonstrates that when investing post-retirement monies, what really matters are total returns and the sequence of those returns, as the income and capital portions of the underlying fund’s returns are taxed identically on withdrawal. It also highlights the opportunity cost associated with reducing your allocation to growth assets. 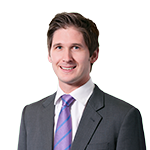 There has been much criticism levelled at living annuities and their suitability for investors. It is clear, however, that there is a direct correlation between the amount saved, returns experienced and the level of income drawn. The sad reality is that if clients do not save enough, then there is no product out there capable of meeting their needs in retirement. What is clear, however, is that funds such as the Investec Opportunity Fund can help an individual’s retirement contributions to work hard enough so as to accumulate sufficient retirement savings and avoid a scenario later in life, where their expenses exceed their income. Under these circumstances a living annuity remains an attractive product as it enables the client’s income to keep pace with inflation and provides a benefit that can be passed on to dependants on the original owner’s death. All information provided is product related, and is not intended to address the circumstances of any particular individual or entity. We are not acting and do not purport to act in any way as an advisor or in a fiduciary capacity. No one should act upon such information without appropriate professional advice after a thorough examination of a particular situation. Collective investment scheme funds are generally medium to long-term investments and the manager, Investec Fund Managers SA (RF) (Pty) Ltd, gives no guarantee with respect to the capital or the return of the fund. Past performance is not necessarily a guide to future performance. The value of participatory interests (units) may go down as well as up. Funds are traded at ruling prices and can engage in borrowing, up to 10% of fund net asset value to bridge insufficient liquidity, and scrip lending. A schedule of charges, fees and advisor fees is available on request from the Manager which is registered under the Collective Investment Schemes Control Act. Additional advisor fees may be paid and if so, are subject to the relevant FAIS disclosure requirements. Performance shown is that of the fund and individual investor performance may differ as a result of initial fees, actual investment date, date of any subsequent reinvestment and any dividend withholding tax. There are different fee classes of units on the fund and the information presented is for the most expensive class. Fluctuations or movements in exchange rates may cause the value of underlying international investments to go up or down. Where the fund invests in the units of foreign collective investment schemes, these may levy additional charges which are included in the relevant Total Expense Ratio (TER). A higher TER does not necessarily imply a poor return, nor does a low TER imply a good return. The ratio does not include transaction costs. The current TER cannot be regarded as an indication of the future TERs. Additional information on the funds may be obtained, free of charge, at www.investecassetmanagement.com. The Manager, PO Box 1655, Cape Town, 8000, Tel: 0860 500 100. The scheme trustee is FirstRand Bank Limited, PO Box 7713, Johannesburg, 2000, Tel: (011) 282 1808. Investec Asset Management (Pty) Ltd is a member of the Association for Savings and Investment SA (ASISA). This is the copyright of Investec and its contents may not be re-used without Investec’s prior permission. Investec Investment Management Services (Pty) Ltd and Investec Asset Management (Pty) Ltd are authorised financial services providers. Issued, October 2017.